Green Data Center Market size was estimated at over USD 5 billion in 2017 and is predicted to grow at a CAGR of over 25% from 2018 to 2024. The green data center market is expected to gain traction owing to the increasing awareness for reducing the environmental impact of traditional infrastructures. Reduction in power usage and energy consumption for complex operations in green alternatives provides economic and environmental benefits to the organizations. These technologies ensure reduced costs and lower the organizational carbon footprint owing to the implementation of energy-star rated power supply systems, LED lighting, routers, servers, high-efficiency HVAC, and centralized humidification systems. A major factor contributing to the increase in deployment of the equipment is the rising electricity costs, primarily in countries such as the U.S., Canada, and Italy. For instance, in 2017, the industrial electricity costs were estimated at USD 20 per kilowatt hour. The high initial investments due to the high costs of these technologies and the overall installation costs are the major challenges hindering the market growth. Despite the high benefits of these technologies, they cost much higher than the traditional systems owing to which accessibility is limited to companies having large financial funds. Additionally, companies already having existing centers are more reluctant to switch to green systems as it requires the replacement of connecting technologies which can be incompatible. For instance, the installation of new HVAC system may not be completely compatible with the installed cooling and heat management systems. In modern infrastructures, the virtual resources and security controls cannot be integrated with physical resources owing to the cloud computing systems. This challenge in the market can be overcome by implementing integrated security control systems and developing security compliant systems. The rising proliferation of cloud technology is a major trend affecting the green data center market. Cloud computing aids in achieving efficient computing utilization and processing. The resources are managed to obtain energy-efficiency by implementing server modes. The cloud automation software aids in maximizing utilization and consolidation to drive the operating efficiencies and power consumption in energy-efficient infrastructures. The proliferation of SMEs all over the world in the IT and telecom sector is increasing the market demand. This causes high organizational data traffic in creating a need to implement these sustainable technologies for efficient and cheap work operations. 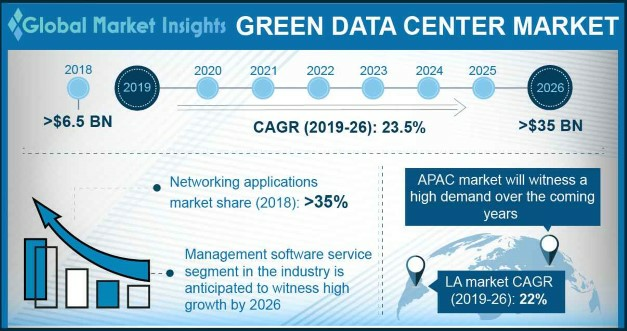 The solutions segment in the green data center market is dominated with over 75% revenue share in 2017 is expected to grow over the future due to the provision of efficient power and cooling components. The abundance of renewable power sources has led to the growth of power technologies that harvest power from hydroelectric, geothermal, and solar energy sources that aid in reducing the overall carbon footprint of the consumer. These solutions ensure the achievement of global sustainable goals by companies adopting the energy efficient technologies. Traditional cooling solutions in the market are responsible for the consumption of over 20% electricity and are required for reducing the heat emitted by these facilities to ensure proper working and reducing the chances of failure to due to data overload. Switching to these technologies provide low-cost cooling options such as water, free liquid, and evaporative cooling techniques that provide higher financial benefits to companies in the long run. The services segment of the green data center market is anticipated to reach over USD 7 billion by 2024. Organizations face challenges in the installation, operation, and modification of these technologies which are resolved by licensing to external service providers having intricate technical knowledge, reducing the costs of hiring and maintain an in-house team. The IT & telecom sector in the green data center market is expected at a CAGR of 28% owing to the rising move toward digitization for conducting everyday activities such as payments, shopping, and more. This has led to the generation of a large amount of organizational data causing an increase in the number of data centers. The installation of energy-efficient solutions can allow companies to lower the power consumption and operating costs. The colocation segment in the green data center market is expected to witness a rapid growth in the forecast time. The high demand for these technologies and the surge in consumer and organizational data has generated a demand amongst the smaller players. However, as most companies, primarily the start-ups have limited financial resources, they are unable to build their own infrastructures, fueling the growth of colocation. This segment requires high scalability and flexibility of infrastructure, propelling the market growth. The U.S. accounts for the highest green data center market revenues in 2017, which is expected to reach over USD 6 billion by 2024 owing to its early adoption of technological advancements. Due to the presence of major consumers, these technologies such as main operating offices and headquarters of major companies, such as Facebook and Google, with complex databases in the U.S. market is adding up to the demand and consumption of the green technologies. Initiatives adopted by various companies to control the environmental impacts and move toward sustainable alternatives are increasing the implementation of these efficient technologies. Additionally, the government has issued that all federal agencies switch to energy-efficient infrastructures. In January 2017, the vote for the Energy Efficient Government Technology Act (HR 306) was launched. This mandated that agencies develop plans in coordination with the Environmental Protection Agency (EPA) and the Office of Management & Budget to implement energy-efficient technologies in their data centers. The industrial and digitization boom in the Asia Pacific region, mainly in emerging economies including India and China, are the major factors driving the green data center market growth. High availability of renewable energy sources, such as longer daylight hours and abundance of water for cooling in South-East Asian countries, is driving the market demand. The increasing demand for hybrid internal clouds, edge computing, and hyper scaling in Japan and China are creating a trend for non-conventional and energy-efficient equipment. The vendors in the market include Huawei Technologies Co. Ltd., Hewlett-Packard, Microsoft, Verne Global, Colocation America, IBM Corporation, and Green House Data. Companies are focusing on developing energy-efficient products and solutions to provide customers with better products and sustain growth despite the high competition in the green data center market space. These companies are investing heavily in R&D activities to improve networking, cooling, and power efficiencies. For instance, in May 2018, Green House Data announced its strategic partnership with Infront Consulting Group, an IT firm that specializes in Microsoft Azure and Microsoft applications. This merger will enhance the company’s automation and DevOps elements and increase the customer base, strengthening its position in the green data center market. The technologies allow companies to produce high energy-efficient and environmental-friendly technologies for complex and large databases. These are needed in the highly complex industry verticals, such as financial institutions and IT companies, to achieve the reduction in capital and operational expenditures. The varying consumer demands related to their increased data capacity and the need to maintain the carbon footprint are creating many opportunities for green data center market players. 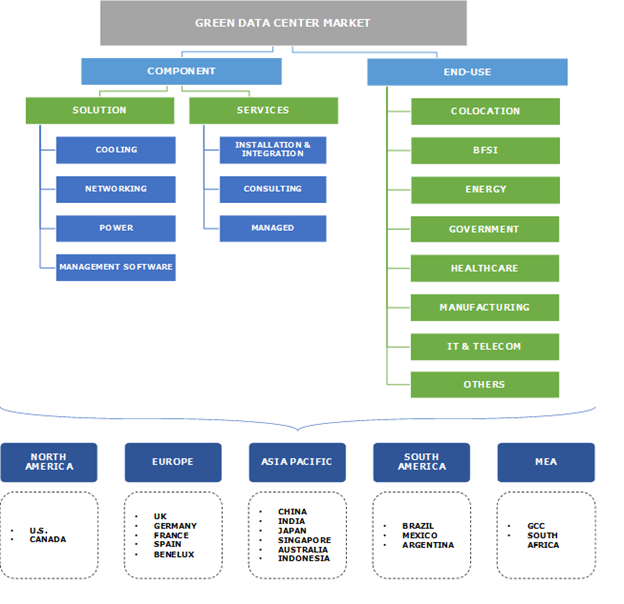 The green data center market is currently at the nascent stage. Despite the high benefits that these products provide, organizations are slow to adopt these technologies. This is largely attributed to the significantly higher costs of these technologies as opposed to the traditional products, such as servers, routers, and cooling systems, causing companies to switch to these systems. For instance, in October 2017, Apple announced that it had cleared USD 1 billion to build energy-efficient structures in Ireland. The growing governmental initiatives for implementing efficient technologies by business organizations in several countries are further fueling the industry growth. In May 2015, Info Communications Media Development Authority, Singapore announced the launch of its green initiative. The initiative is aimed to boost the industry competitiveness by reducing operating cost, focusing on environmental impacts, and improving energy-efficiency.